Red Admiral Egg. Side view of an egg attached to a stinging nettle (Urtica gracilis) leaf. Magnified 63x. Newly Hatched Larva. This newly-hatched, or first instar, larva is magnified 50x. The term "instar" refers to a period between the times when the larva molts, or sheds its skin. As it grows, the larva will pass through five instars. Not only does the larva grow bigger after each molt, but it also changes greatly in color and appearance. Its spines, which start out as fine and hairlike at this stage, grow longer and more branched in later instars. Second Instar Larva on Stinging Nettle (Urtica dioica). The actual length of this young larva is 3.8 mm (0.14 inches). Photographed August 10, 1997 at a magnification of 25x. 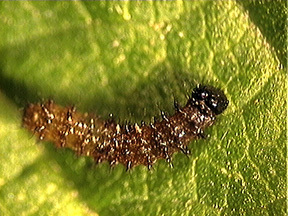 Fifth Instar Larva. This larva has reached full size, and will soon molt and become a chrysalis. It is now about 50 mm (2 inches) long. Chrysalis. Three days after pupation. As the chrysalis develops, its color will change. Several days before the adult butterfly emerges, its wing colors will be visible through the pupal shell. This page was most recently updated on March 5, 2002.